On February 16, 2018, US Secretary of State Rex Tillerson completed a week of marathon talks across the Middle East, which took him to Egypt, Jordan, Kuwait, Lebanon, and Turkey. Tillerson’s trip to the region should be considered an overall success for US diplomacy at a time of heightened regional tensions, including between Washington and Ankara over the role of Syria’s Kurds in the post-Daesh environment. The top American diplomat also succeeded with convincing the Gulf Cooperation Council (GCC) members to make significant pledges for the reconstruction of Iraq despite their sharp internal divisions over the Gulf crisis, which has pitted Bahrain, Saudi Arabia, and the United Arab Emirates (UAE) against Qatar. Although the unresolved Gulf crisis is far from winding down—as the harsh rhetoric against Qatar continues unabated—it was nonetheless a diplomatic victory for Washington that Kuwait pledged $1 billion in loans and $1 billion in direct investments; Saudi Arabia and Qatar each pledged $1 billion for the reconstruction for Iraq. The UAE pledged $500 million in assistance and $5.5 billion in loans for the Baghdad government. The biggest single pledge, however, did not come from a GCC country but from Turkey, which announced $5 billion in credit to Iraq. The European Union also pledged $494 million. The US, for its part, did not offer direct donations but agreed to provide over $3 billion in loans and financing to American firms wanting to invest in Iraq. In total, over $30 billion in pledges were made at the Kuwait Summit. Although the pledges fell short of the estimated $88.2 billion needed to rebuild Iraq, the commitments made underscore the international community’s commitment to help stabilize Iraq through private sector investments. Despite Tillerson’s success in Kuwait, the unresolved Qatar crisis has brought strategic failure to the Gulf, including for Washington and its regional agenda, as the GCC states (except for Kuwait and the UAE) provided minimal pledges. The GCC crisis has for all practical purposes divided the GCC into two camps, which pits Bahrain, UAE and Saudi Arabia against Qatar, Kuwait, and Oman. Given these dynamics, it was a US diplomatic victory that Tillerson was able to make incremental progress on issues pertaining to Iraq’s reconstruction, even if Saudi Arabia and Qatar failed to meet their respective donor potentials. The Kuwait Summit builds on the recent Saudi-Iraqi rapprochement, which was institutionalized in October 2017 with the Saudi-Iraq Coordination Council’s (SICC) inauguration. In addition to strengthening the bilateral relationship between Riyadh and Baghdad, including through enhanced economic cooperation, the strategic objective behind the SICC is to counter Iran’s regional agenda. During the post-Daesh phase, Washington is executing what appears to be a two-pronged strategy that focuses on the reconstruction of territory liberated from the terrorist group, while at the same time seeking to ensure that Iraq does not evolve into an Iranian vassal state built on Lebanon’s Hezbollah model. To that end, Washington’s priority is to preserve the gains achieved against Daesh by ensuring that hostilities between the Kurdistan Regional Government (KRG) and the central government in Baghdad do not break out. On the later issue, Washington successfully persuaded Baghdad and Irbil to hash out their differences following the Kurdish independence referendum in September 2017. That success, along with the inauguration of the SICC, have not only proven to be a game-changer for regional security but have helped build the necessary confidence between Iraq and the GCC leading up to the Kuwait Summit. The SICC provides Riyadh with a bilateral forum where it can apply pressure on both Irbil and Baghdad to work out internal differences. By helping to ease Irbil-Baghdad tensions, the bilateral council is strengthening Iraq’s independence at the expense of Tehran’s influence in Iraq. Moving forward, however, Washington too must have realistic expectations about dealing with Tehran’s hand in Iraqi politics. To achieve the strategic objective of preserving Iraq’s sovereignty and independence from the Islamic Republic, Washington clearly linked the Kuwait Summit for post Daesh reconstruction to efforts to strengthen GCC-Iraq relations. Within this context, the SICC, and followed up by the Kuwait Summit, is not only about establishing a mechanism for strengthening Saudi-Iraqi ties, but also about deepening the multilateral relationship between Baghdad and the GCC. The strategic benefit of the SICC launch and the Kuwait Summit is that has helped provide Baghdad with an alternative to balance Iraq’s fragile relationship with Tehran. Adding to the Kuwait Summit’s success to help strengthen the Iraqi state in the post-Daesh environment is the fact that NATO Secretary-General Jens Stoltenberg announced that the alliance would expand its military training mission in Iraq and help the country develop new academies and schools for its military. Stoltenberg added that NATO would “scale up” its mission, underscoring that the mission would train Iraqi officers so that they could themselves train their own troops. Stoltenberg, however, declined to say how many more troops would be involved or where the mission would operate. In subsequent developments, the Trump administration recently announced that it was “planning for an open-ended mission of forces in Syria beyond” the fight against Da’esh. According to a letter obtained by The New York Times from Deputy Undersecretary of Defense for Policy David Trachtenberg to U.S. Senator Tim Kaine (D-VA), US troops might strike at Syrian government or Iranian forces deemed to threaten Americans or Syrian rebel groups that have been tasked with fighting Daesh. Washington’s decision to maintain a long-term military presence in Syria and Iraq help explain the recent tensions in the U.S.-Lebanon relationship as witnessed during Tillerson’s visit to Beirut on February 15. In an unprecedented move, the Lebanese government allegedly kept Tillerson waiting for 30 minutes before Washington’s chief diplomat was able to meet his Lebanese counterpart, Gebran Bassil. 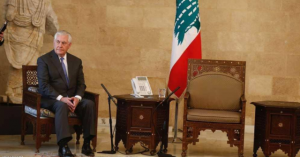 The snub underscores how the Lebanese government, which Hezbollah is a part of, mistrusts Washington’s decision to maintain a long-term presence in neighboring Syria. The Lebanese government, however, has since denied that it kept Tillerson waiting. These dynamics, fueled by underlining tensions between Washington and Tehran over Syria, explain the recent flare up between Iran and Israel after a Syrian anti-aircraft fire downed an Israeli F-16 returning from a bombing raid on Iran-backed forces’ positions in Syria. The incident, which took place on February 10, could also be interpreted as a signal to Washington and the GCC ahead of the Kuwait Summit that Tehran will not compromise on its regional agenda, which directly clashes with Washington’s in Iraq and Syria. A Path Forward with Turkey? 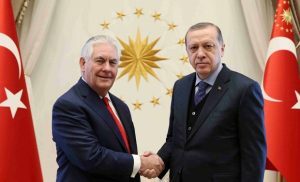 Following the Kuwait Summit and his subsequent visit to Beirut, Tillerson managed to de-escalate US-Turkish tensions over Syria during his meeting with President Recep Tayyip Erdogan in Ankara on February 16. That a thaw in the strained bilateral relationship was within reach became evident during the Kuwait Summit as Ankara pledged the largest amount for Iraqi reconstruction. Although President Erdogan’s harsh anti-American rhetoric continues to frustrate Washington, the US diplomatic approach towards Turkey is focused on separating political tensions that plague Washington-Ankara relations from the two countries’ strategic cooperation via NATO. As a founding member of NATO, Turkey has been a US strategic ally, beginning first in the early days of the Cold War in the struggle against Soviet expansion of the Soviet Union, as underscored by Turkey’s role in the Korean War, and most recently in Afghanistan where Ankara remains an active partner. Washington and Ankara have respectively gone to great pains to preserve their alliance, despite increasing political tensions in bilateral relations following the failed coup d’état against Erdogan in July 2016. Ankara has long considered Washington and its fellow NATO members’ response to the traumatic event as inadequate, at best. According to the Turkish leadership, the Pennsylvania-based cleric Fatullah Gulen and his movement were behind the coup plot through their alleged infiltration of the various levers of Turkey’s bureaucracy. From a US perspective, which is shared with its European allies, the Erdogan government’s purge of an estimated 200,000 civil servants—ranging from judges to school teachers and military officers—is a gross violation of basic human rights in its failure to provide each individual due process. Complicating the matter is the US-led Coalition Against Daesh decision to arm the dominant Syrian Kurdish militia in its fight against Daesh in Iraq and Syria, which Ankara considers to be a terrorist organization linked to the Kurdistan Workers’ Party (PKK), which the Turkish military has been fighting since 1984. Given these constraints, Tillerson’s ability to negotiate a de-escalation framework was a success. With the annexation of Crimea in 2014, Russia, which fought the Ottoman Empire in 11 wars against throughout its Ottoman history, became an even greater strategic threat to Ankara since Moscow positioned the headquarters of its Black Sea Fleet at the Crimean port of Sevastopol. The annexation of Crimea also presents a threat to Turkey because of its geographical proximity. This, coupled with the fact that Russia has deployed strategic weapons in neighboring Armenia leaves Turkey with little strategic maneuverability but to relay on NATO, despite Erdogan’s flirtatious rhetoric with Russia and Iran. Turkey was once again reminded of this reality when it shot down a Russian fighter jet over Syria in 2015, which in turn triggered a NATO emergency meeting. At the meeting, Turkey received unanimous NATO solidarity. But while Washington fears that Erdogan is moving closer to Russia and Iran, Washington considers these moves, which are motivated by rhetoric and Erdogan’s Islamist ideology, to be merely tactical because of Turkey’s aforementioned limited strategic maneuverability. Washington, however, considers Turkey’s bitterly divided political climate a greater threat to its long-term stability and alliance as opposed to Erdogan’s well-known rhetoric. Turkey, however, believes that Washington – along with its fellow NATO allies – does not take seriously the Kurdish terrorist threat stemming from Syria and Iraq. Given these constraints, it was therefore another US diplomatic victory that Tillerson, along with his Turkish counterpart, Mevlut Cavusoglu, agreed that a United Nations sponsored peace process for Syria was the only acceptable framework as opposed to talks jointly sponsored by Russia, Turkey, and Iran which had been floated through various media reports. “Recognizing the fact that there can only be a political solution to the Syrian crisis, and that it requires a viable political transition, Turkey and the United States agree to intensify their cooperation to bring about this result within the framework of established parameters, namely the UNSC Resolution 2254, and through the Geneva process,” the Tillerson- Cavusoglu joint statement said. Despite the strategic failure the Qatar crisis has brought to the Gulf – which has effectively split the GCC into two sections – coupled with the structural challenges pertaining to the US-Turkish relationship, Tillerson was nonetheless able to deliver a narrow US foreign policy victory at the Kuwait Summit where Washington’s regional allies were able to put their differences aside in order to provide funding aimed to help bring stability to the post-Da’esh Iraq. Tillerson’s foreign policy successes in Kuwait and Ankara underscore that Washington values its strategic partners and will continue to push for GCC reconciliation as part of a strategic objective to preserve the fragile stability of the Gulf while at the same time build on the ongoing momentum to strengthen the US/GCC/Turkey alliance against Tehran and its destabilizing regional agenda. The emphasis on a unified GCC in order to isolate Iran regionally coupled with the need to jointly fight the reminiscent of Da’esh in Iraq and Syria, along with other extremist groups, are expected to top President Trump’s agenda for his respective meetings with the leaders of Saudi Arabia, the UAE and Qatar. The apparent U.S. strategy behind the respective bilateral meetings with the three GCC leaders is to narrow differences between them so that when the proposed US-GCC Summit at Camp David eventually takes place, all differences will have been ironed out and that the meeting will formally put an end to the standoff. By Sigurd Neubauer, GFI Non-Resident Fellow, Middle East Analyst and Columnist based in Washington. Secretary Tillerson To Travel to Amman, Ankara, Beirut, Cairo, and Kuwait City, U.S. Department of State, 8 February 2018. J. Gambrell, “$30 billion pledged in Kuwait at summit to rebuild Iraq,” The Associated Press, 14 February 2018. G.A. Khan, “King Salman hails Iraq’s gains against terrorism at council launch,” Arab News, 23 October 2017. L. Cook, “NATO to expand Iraq military training mission,” The Associated Press, 15 February 2018. C. Savage, “U.S. Says Troops Can Stay in Syria Without New Authorization,” The New York Times, 22 February 2018. “Lebanese officials deny president kept Tillerson waiting,” Reuters, 15 February 2018.